Based on several years of vintage Ampeg B15 designs, the Trip Top combines the original circuits of both the Ampeg B-15NC (1964) as well as the later B-15NF (1965-67). The B-15-NF channel has the volume control section before the tone stack and in the B-15-NC channel it is after. Maintaining these circuits keeps the same gain structure and biasing found in the original B-15N amp designs, helping to preserve their true heritage. It also has two power supply settings – Cathode and Fixed bias to provide further tone structure. The Trip Top is designed to output approximately 30 watts in cathode bias mode and 40 watts in fixed bias mode. I cannot recommend this amp highly enough. You guys hit this one out of the park! After almost 3 years and hundreds of hours of playtime, there has been zero problems with my TripTop. I ran 6L6GCs at 51 watts for the first year and it has run on KT88s at 66 watts for the last 2 years. Great amp. Great Sound. Buy one. The TRIP TOP is effectively four amps in one, which you can alternate between channels and the simple flick of the bias switch. It has two channels each have volume with a ‘Pull Bright’ switch, treble and bass controls. The first channel, NORMAL, from the B-15-NF, has the volume control section before the tone stack. The second channel, CASCADE, comes from the B-15-NC which has the volume control section after the tone controls. The power amp section has two switch selectable bias modes – fixed (B-15NF) and cathode (B-15NC). While 1N4007 solid state rectifier diodes were used for the “NB” configuration, this was not incorporated into the design. The Trip Top is built using point-to-point wiring using turret board construction for optimal service and reliability. High-quality tubes, coupling capacitors and resistors are selected for maximum tone, performance and reliability. The Trinity Amps power transformer and output transformer are all custom built and selected for maximum tone, performance and reliability. What differentiates our kits from others is part quality, fit, documentation and support. Included is all components; Mallory 150M caps; CARBON FILM and CARBON COMPOSITION resistors; SWITCHCRAFT or CLIFF jacks, ALPHA pots, JJ 50/50uf filter cap; Belton Micalex tube sockets, tube retainers & shields; 1/8″ thick GP03 Turret Board with large size KEYSTONE Turrets; CARLING switches; high current impedance switches; All 22 gauge hook-up Wire; Pre-twisted heater wire; BELDEN Co-Ax cable; All Mounting hardware, spacers and nuts; 3 Inputs; AMPEG style control knobs; Pre-Cut 0.06″ MIRROR FINISH STAINLESS STEEL Chassis with tapped holes for mounting screws; SILK SCREENED Front and Rear chassis labels; Detailed Assembly guide; large 11″ X 17″ size layout and schematic drawings and REAL Support. Also included in the kit package is our Highly Rated, Custom Made Transformer set by Heyboer. 117V 60Hz / 234 50Hz Primaries It is built to our specifications but based on original AMPEG transformers used in the early B15 amps. The Power transformer is rated at 300 mA compared to under 200mA originals and all other current third party suppliers including Ampeg’s re-issue. The output transformer has 3 Interleaves and heavier gauge winding than originals and multiple secondary windings (4, 8, 16 ohm support). This is an excellent B15 transformer. With our over spec’d and non-potted iron, you can optionally run KT88 POWER TUBES increasing the power output. 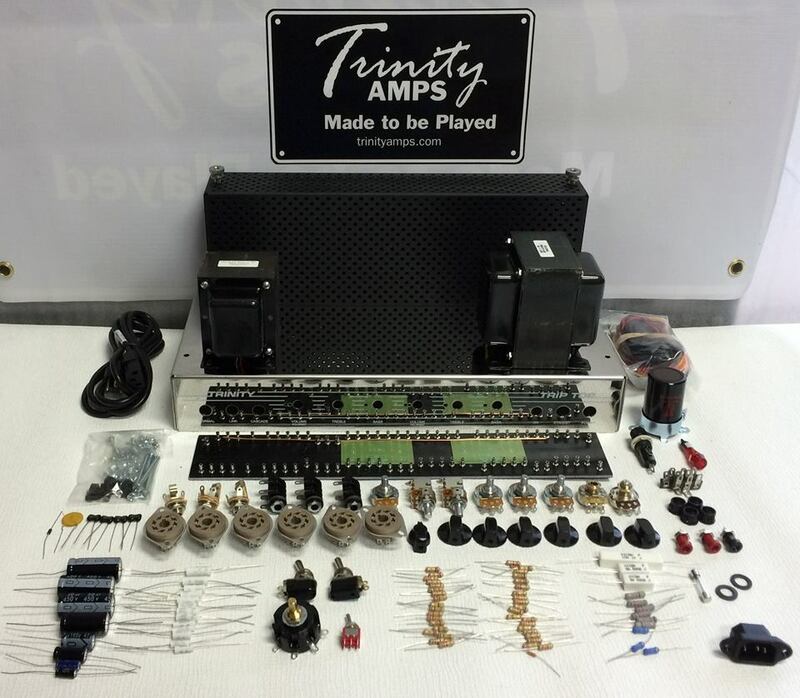 The Trinity Amps power transformer and output transformer are all custom built and selected for maximum tone, performance and reliability. I can not recommend this amp highly enough. You guys hit this one out of the park! After almost 3 years and hundreds of hours of playtime, there has been zero problems with my TripTop. The only issue is that the KT88s are too close together and it sounds like Trinity has addressed this point with wider spacing between tubes on the chassis. On the original chassis, I have the tubes separated using the red gasket rings but so much heat is generated that they have melted. The tubes have not exhibited any problems though. I ran 6L6GCs in it for the first year. It has been run for the last 2 years on KT88s. Even with the KT88s, the power transformer is barely warming. In case anyone is interested, I took some bench measurements on it tonight. All measurements were taken using the normal channel. Fixed bias was used, cathode bias resulted in lower values. Bias on each set of tubes was set to 70% dissipation. Voltage output did not vary much when frequency was varied but both tubes lost a bit of output as frequency dropped below 500Hz. In both cases it was less than a volt down to 50Hz. A 4 ohm resistor was used as the output load. Measurements were taken using an oscilloscope at the point of visible distortion in the waveform. Higher power is possible with distorted waveforms. Trip Top kit includes all components except tubes, speaker and cabinet.